Firstly apologies for any glitches in this blog – it’s been a bit chaotic trying to do it with intermittent internet & different wifi locations!! I can’t believe where the last few days have gone. 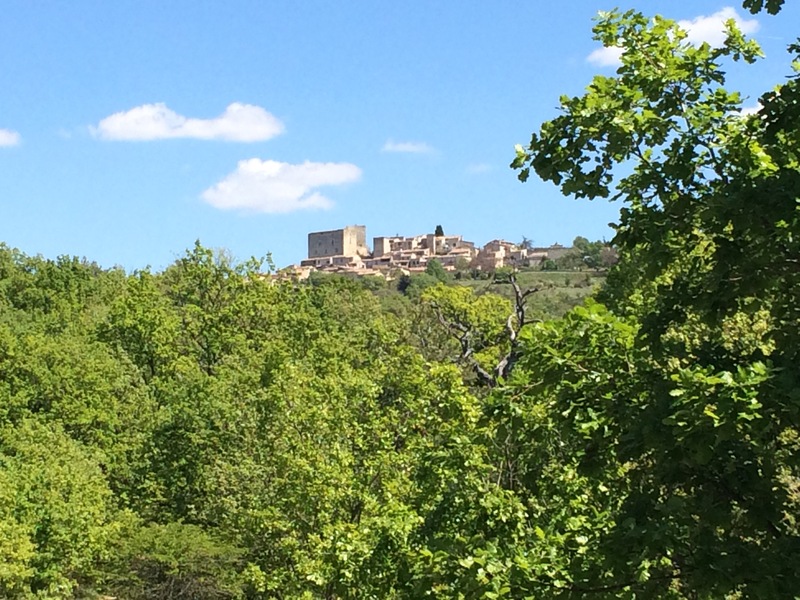 A week ago I had just hosted the village book group and this morning I’m sitting on the terrace in the sun with breakfast, looking across the field in front of the house towards the pretty hilltop village of Caseneuve. 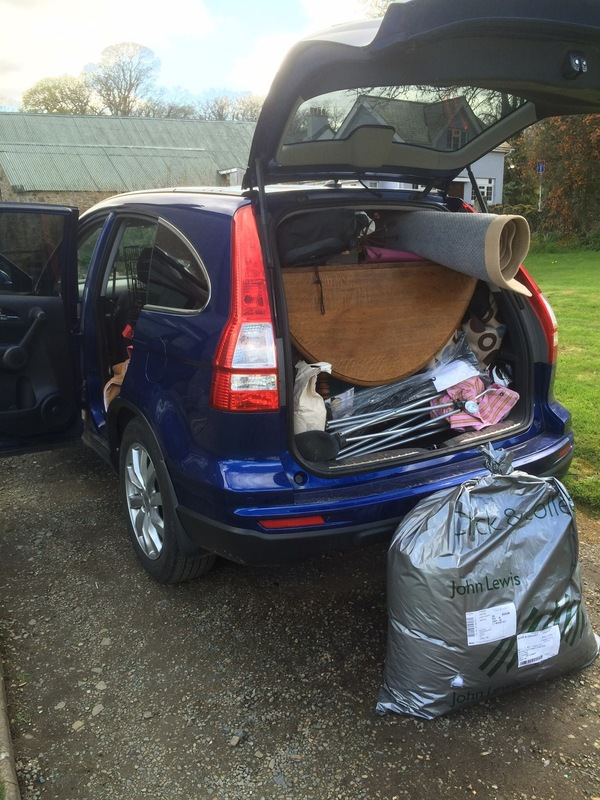 Moving house anywhere classes as one of the highest stress activities… And whilst I know that this habit exactly been a full-blown house move it certainly has had its frustrating moments. The first problem was what to take with us in the car. There were certain ‘must-take’ items, including bikes, a blow up bed and comfortable English pillows, a folding chair, tools, cycling kit, clothes and of course the cat! However in the days before our ‘grand-depart’ we had managed to accumulate a mountain of bits that was threatening to burst out if the conservatory, including a chest of drawers, an old gate-leg table, various rugs, paints and other things, which needed to be fitted in. I did the practical thing and (with hubby’s blessing) headed off for a couple of days with an old friend, leaving him to work his magic in trying to get everything into the back of our Honda. the words quart & pint pot come to mind! In the end he somehow managed to get it all but one pretty old French chair in, still leaving space for the cat’s basket – a work of genius if you ask me! So loaded up to the gunnels we left the house at 2.30 in Sunday morning, finally arriving in L’Isle Sur La Sorgue shortly before 8pm. A long and tiring day, but worth it. We all then headed to the Notaire’s Office ( not a wood-panelled room I would have expected at home) – this was a high-tech space where the Notaire’s ran through the Act of Sale in a wall-mounted screen and we signed our names on a digital pad – certainly no sign of any old-fashioned ink and blotting paper there. 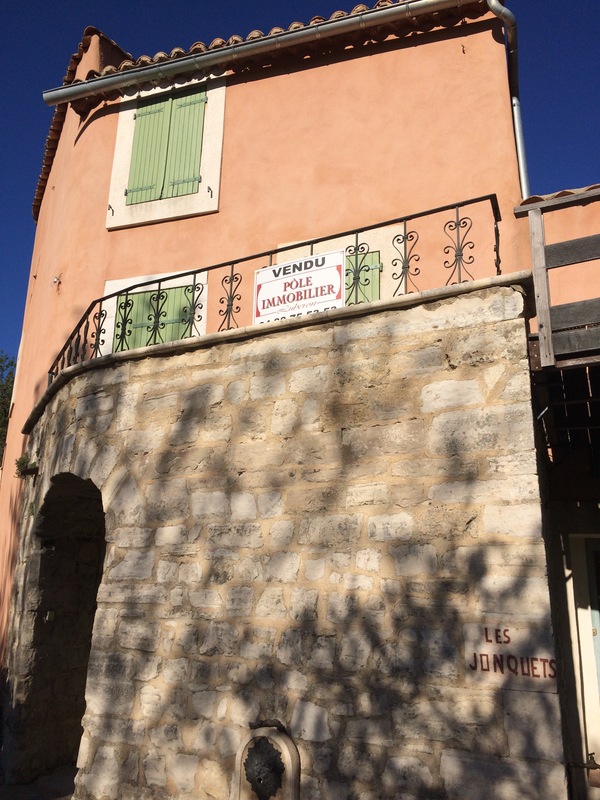 And that was it – by 10.45 we had the keys in our hands and ( in a state of excited shock) drive out to our new home in Provence. The first day was a whirl of emptying the car, buying some essentials including the basics of life and ordering important electrical items ( to be delivered at the weekend). We were also able to sort out a few other things – whilst the light bulbs remained the connectors for the gas hob hadn’t, but after a chat to the ever helpful agent she pointed us in the direction of Leclerc, where we found the bits we needed and by the end of the day (thanks to my hubby) we had a fully functioning hob and finally managed to sit on the terrace, watching the shadows & colours of the sunset, before collapsing exhausted into the blow-up bed. The following day saw us up early so that we could enjoy a couple of hours together before (sadly) Andy had to head home. We always knew this would be a very fleeting visit, but at least he was able to come out and spend that first crucial 24 hours in our little place. After dropping him at Marseille I headed off to experience the delights ?! of shopping for sofas & beds at IKEA. 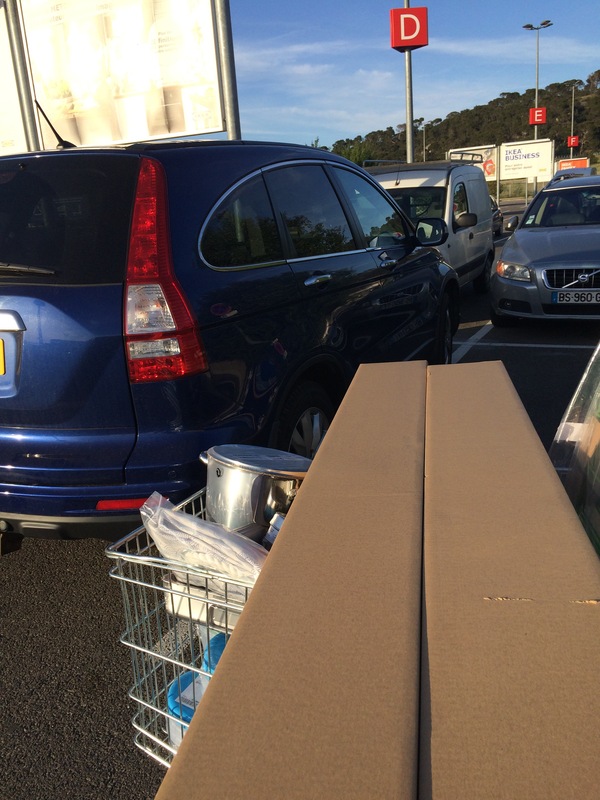 The good thing about IKEA in France is that the shops don’t seem as chaotic as the ones in the UK and more importantly it is easy to order in store & arrange deliver, which is great when you need sofas, mattresses etc. I quickly had everything sorted and a trolley full of other bits. What I hadn’t fully thought through was the payment. When I got to the till I handed over my French Bank Debit Card, which was duly refused as the ‘plafond’ was too low, which left me absolutely stuck, I had left the cheque book at the house & didn’t have my credit card either, so was left with no other option but to leave my stacked trolley & order at the till & do the walk of shame out of the store. It’s now Friday & I’m settling into life with just me & the cat – although my next worry is when to allow her outside with some degree of confidence that she’ll return! 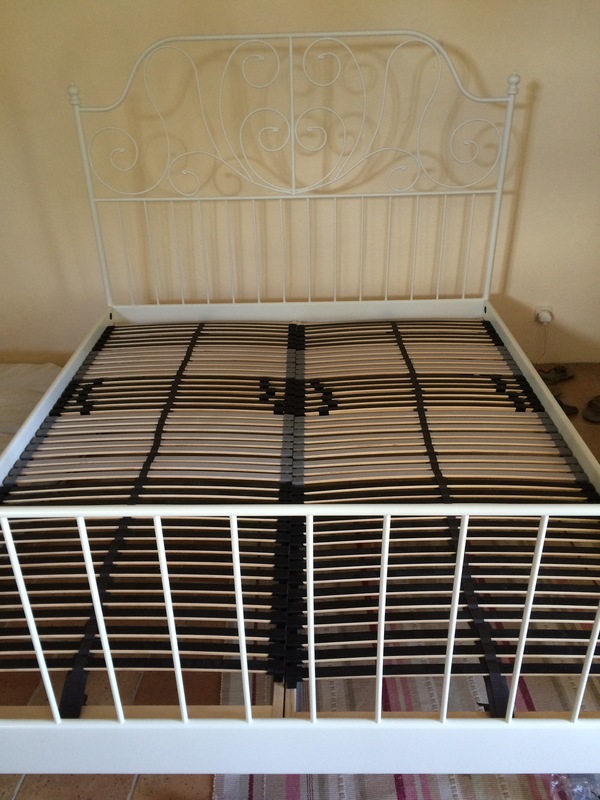 I’ve managed to build myself a bed ( and very proud of myself I am too) albeit still as a base for the blow-up mattress and have started to paint the pieces of furniture we bought with us to make them look more at home here. happily it hasn’t fallen to pieces yet! I’m delighted to find that I have a lovely neighbour, who yesterday contacted her builder to come and drill a hole in the wall for our telephone cable to be connected, so I can get internet sooner rather than later. 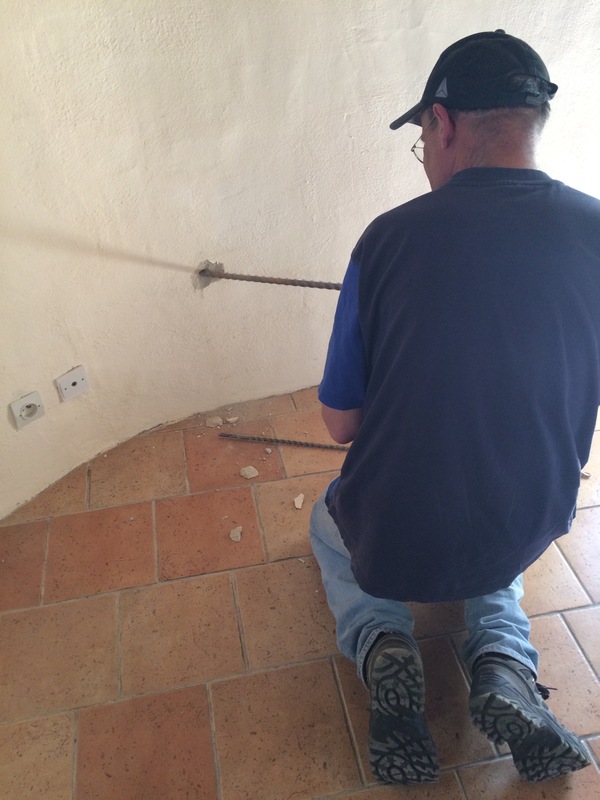 He arrived within the hour and after 2 hours af hard graft had managed to secure a tube through our metre thick wall so France Telecom can return next week to connect it all up. I have managed one quick trip to a market so far – in the pretty village of Goult, where amongst other things I bought local strawberries, which I’ve already made into jam. So far so good – the biggest frustration for me is the lack of Internet or even phone at the house ( but we always knew this was the case) – so each day I head off to the locally recommended Wifi hotspot that is McDonalds in Apt to buy a coffee & SKYPE the boys at home. 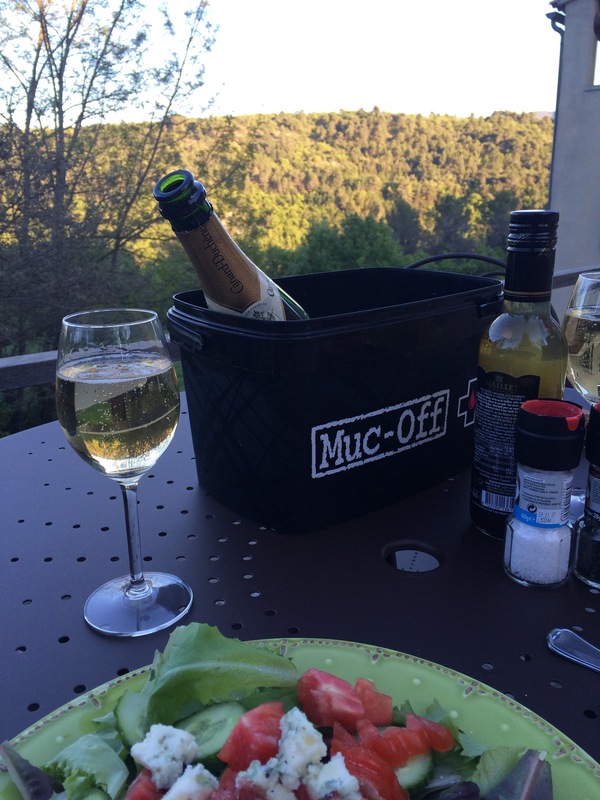 Apart from that the frustrations I have quickly disappear when I sit on the terrace in the sun listening to the constant chatter of birds & the occasional grunt from a Sanglier in the woods below ….. Long may it last! how can you not be enchanted with a view like this? I love the color of your new home…and the view….to die for! Congratulations! 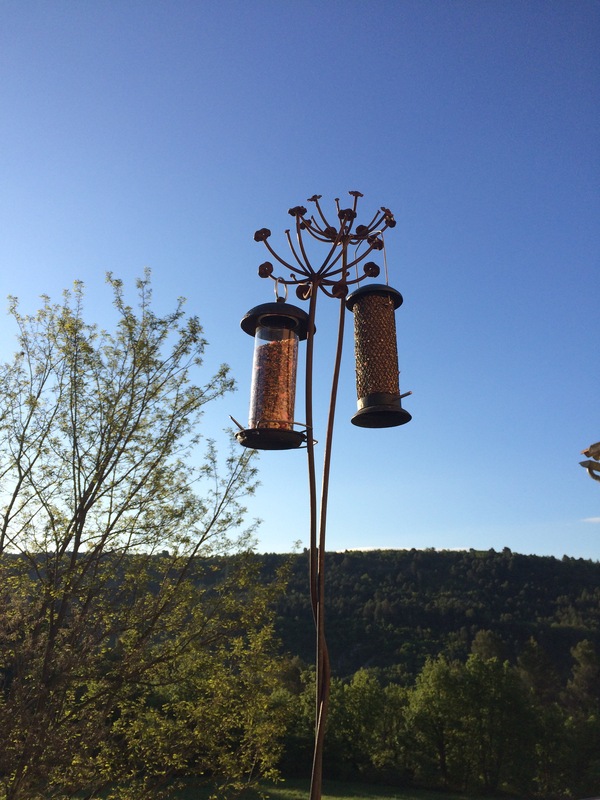 Thanks, we’re so thrilled – just need to buy an olive tree & a few lavender plants & the look will be complete! Thanks – good old IKEA – once we have a proper mattress we won’t know ourselves ! We just moved, so I feel your pain. 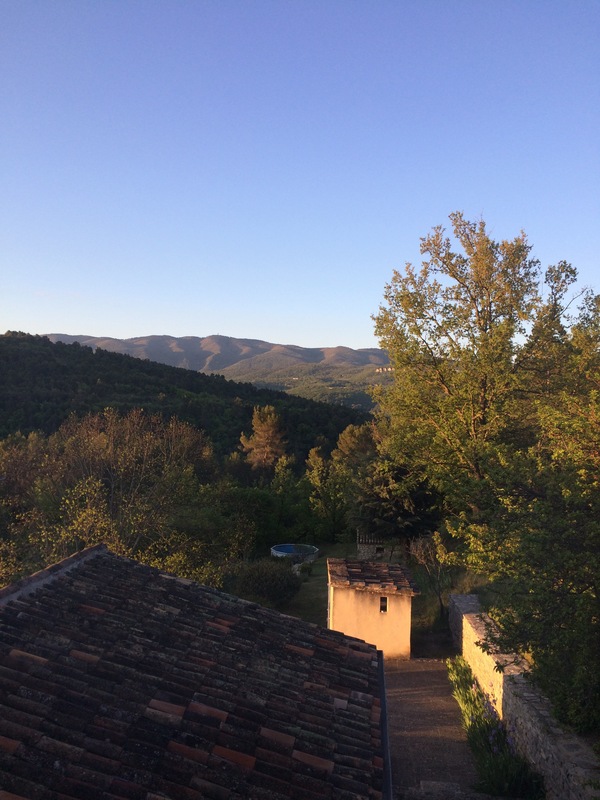 But to be in Provence! What a dream! We love the village of Goult and look forward to staying there soon. Any stress just melts away quite easily now we’re here. 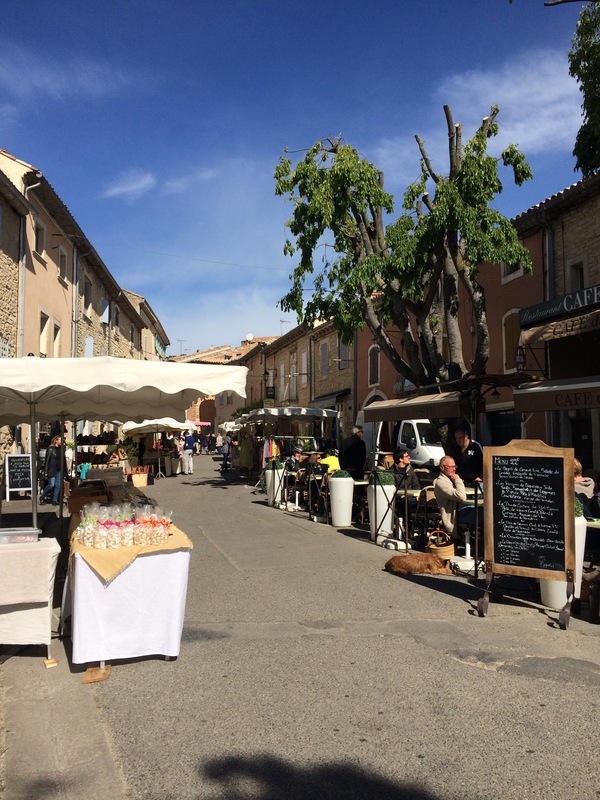 Goult is lovely & the little Thursday market will be a regular stop for us during the summer, particularly now I’ve tried the fig & raisin bread from the boulangerie near the Mairie! Wow! You have done so much in such a short space of time. Brilliant. Can relate to searching out McDos for…Internet. 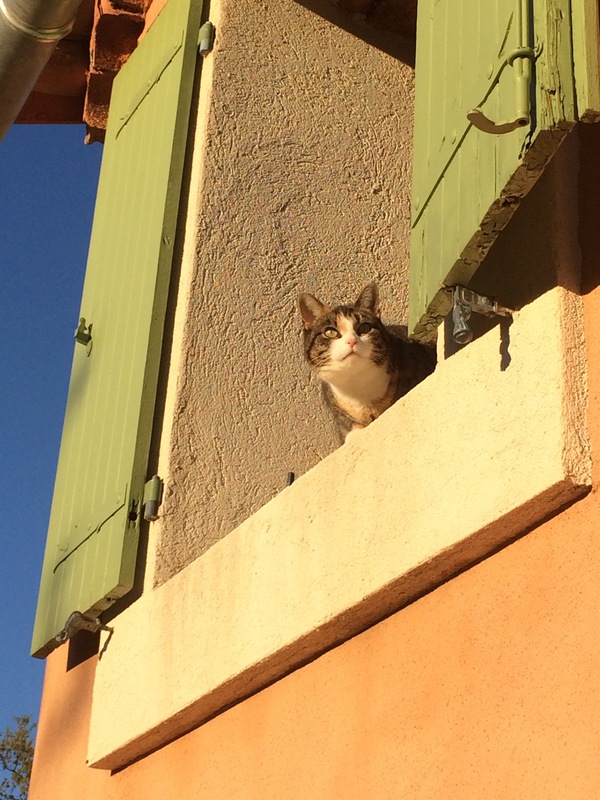 Thanks – the nice thing is even when things are frustrating (France Telecom being the latest) I just sit back, look at the view & smile. McDos is becoming a second home – it’s amazing how long I can make a ‘chocolat chair’ last!